The image of the serigraph above is simply stunning in person. As some serigraphs do, this one has a luminescent quality that cannot be captured on a photograph or computer screen. It took my breath away when I first saw it in a gallery in Carmel, CA, nearby his studio and atelier. The odd thing is I had seen a similar view the day before while driving up the coast highway en route to Hearst Castle, Carmel, and Monterey. The cows idling on very steep ochre, golden colored slopes throwing elongated, surreal shadows provided a momentary visual delight. To find Earle’s image the very next day, where he elegantly captured such a view, was another mind blowing surreal experience. This post is a revised chapter on defining art print terms from How to Profit from the Art Print Market, 2nd Edition. It is a book with detailed inside information on how to sell art prints. It is crucial to understand the various media in which original works are reproduced as prints. The goal here is to explore print media and the art print terms that describe them. Doing so will help visual artists determine what medium to use. It also will help with the other art career decisions such choosing self-publishing or seeking a publisher. These decisions are driven to some extent by what kind of art print best suits an artist’s work. For instance, if you create novel pieces that include teddy bears, you are best suited for the poster market with those images. On the other hand, if you create large abstracts, it is probable that serigraphs or giclees will be your medium of choice, although over-sized posters using this style is a growing market segment. There are economics around producing and marketing different types of media. You will find it typical that publishers who sell posters most likely do not carry more expensive limited edition and higher end works. That means you have different decisions to make regarding which method you think best represents your art or best represents your chances for success in publishing, and what companies to approach if you wish to collaborate with an established publisher. The following list of art print terms is neither encyclopedic nor a complete technical explanation of print types, but rather a brief description of the types of prints that buyers at fine art tradeshows, such as ArtExpo New York and the West Coast Art & Frame Expo. Usually, serigraphs are reproductions from an original, but they also can be an original graphic. In reproductions, either the artist or a person known as a Chromist identifies in minute detail by shape on a separate screen each individual color in a piece of art. With an original graphic, you find the piece designed and created as a serigraph. Although modern materials have replaced them, silkscreens were originally made from stretched silk, ergo the name. With each individual color separated, and with an opening on its screen to squeegee ink onto the art paper in a special press, the printing process begins. Some intricate silkscreens have 100 or more colors meaning that each print must pass through the press 100 times. To make a run of 350 prints in a limited edition can cost upwards of $50,000 or more. The price depends on the number of silkscreens used in the job. Serigraphic work today has been largely automated, and as a result, it is a medium that crosses over between the top- and middle-tier shows. Hand-pulled serigraphs, often pulled by the artist, are still widely used by the printmaking community. Middle-tier publishers and artists also include automated serigraphy with digital printing to create mixed media art. Just as the art community used serigraphs to counter the negative connotation of silkscreen printing, which is an inexpensive method used by commercial printers, the art term “giclee” entered the art lexicon. The idea was to overcome negativity toward using the common term of digital print, or computer-generated art. This digital print format is the most widely used form of limited edition prints sold today. And, it is now, due to increased print speeds and lowered printing costs, making significant inroads into the open edition print and poster market. It took years for the giclee print to gain full acceptance in the industry. This was mainly due to the controversy surrounding its initial colorfastness reliability. And, because the images were computer-generated. New and continuously evolving equipment and archival inks, dyes, solvents, printing processes, substrates and finishes have all but eliminated the criticism. An inevitable initial resistance to technological advances contributed to the hesitancy for many in the art community to embrace the giclee as a legitimate medium. The format warrants further study. Print-on-demand technology (POD) has become one of the most transforming developments for artists in our lifetime. Giclee printing is just one kind of POD. You see POD footprints in music and literature, and its sweeping effects have changed those fields, as well. It is a freeing technology in that it puts the ability to create fine reproductions in the hands of artists, without their having to resort to traditional methods of producing and distributing their work. Giclees, photographs, or any digital image that is embellished or otherwise reworked after being printed. Due to the widespread use of the giclee art print term throughout the industry, rather than go into an in-depth look at giclees here, you will find that Chapter Sixteen of How to Profit from the Art Print Market. You can find numerous other articles on ArtPrintIssues.com on giclees and the print market. The origin of the term giclee has passed into near folklore. For the best, most accurate, description of how it came about, read “What’s In a Name: The True Story of “Giclee.” It is an article from adapted from Chapter 1 of Harald Johnson’s book, Mastering Digital Printing, Second Edition (Digital Process and Print. The book has long been considered the Bible of the digital print market. This art print term is mainly used to describe art on paper via the traditional four-color offset printing process, although you will find some six-color press runs used today. While some publishers still use “limited edition reproductions” to sell offset limited edition prints, it has faded as a viable option in the onslaught use of giclee prints. Incidentally, the record for largest limited edition print, “Sacred Ground” by Bev Doolittle, was an offset print. It has more than 69,000 prints in the edition. (An interesting side note is that Doolittle returned to the limited edition market for the first time in eight years in 2007. Her publisher, Greenwich Workshop, issued the new piece in (you guessed it) giclee format. The story goes that Doolittle was working in stone lithography to create this new image, but there were problems with producing in that format. The next step was to move to the giclee format as a replacement. There were two sizes of prints made as separate editions of the “Beyond Negotiations” acrylic original. The total number of pieces in both editions was about 4,000, and they sold out at the publisher level, quickly, proving Doolittle’s drawing power was still impressive, although not to the enormous extent it was the late ‘80s and early ‘90s. Offset printing is not as dominant as it once was because the only cost effective way to afford an offset print edition is print it all at once. The cost per piece for open editions is usually not practical for less than 1,000 copies. This means you, or your publisher, are betting there will be enough sales to break even on the printing and marketing costs, other overheads notwithstanding. Time-limited pieces, as Doolittle’s “Sacred Ground,” abated this problem, but they are a rare anomaly to the normal process and are not an effective marketing tool these days. The giclee printing process has eroded the limited edition on paper market segment for obvious reasons. 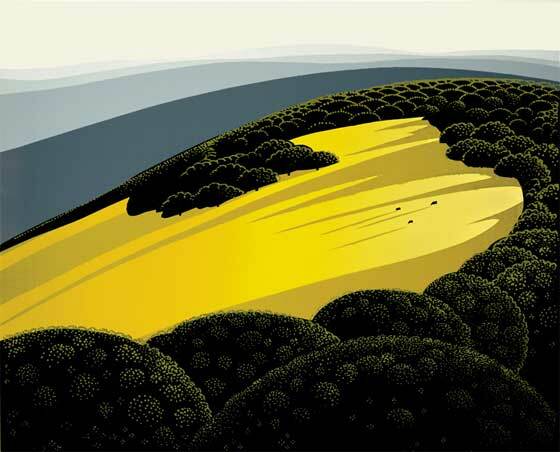 All the same, on a cost per piece basis, offset limited edition pieces cost less to produce than giclees and still have appeal to some publishers and collectors. Spend time at any art tradeshow now and you’ll be hard pressed to find artists or publishers offering limited edition offset lithographs. In their heyday, you would find the editors of art trade magazines using art print terms “open edition reproduction” to describe offset lithographic prints as those images printed without any graphic or type on the surface, and sans the fly spec bold print acknowledging the publisher, while using “graphics” to describe original art made as prints. An example of the latter would be an etching.Today, the public and those within the industry use the term “poster” synonymously with open edition print. However, reading the following description reveals why using the term in this way is technically incorrect. Here, the classic definition of a poster is an offset lithographic image with type or other graphic elements included as part of the print. A classic example is the vintage poster. Henri Toulouse-Lautrec and other French graphic artists of his day popularized this form. They designed prints specifically to “post” advertisements. It is from this use that the word poster came about. Thus, despite the lack of uniformity, there is a true distinction between posters and open edition prints in art lexicon. As you know, the term poster is widely used to describe art on paper in open edition, regardless of the distinctions noted here. The “poster” moniker has stuck to the offset litho-medium with artists, publishers and consumers. In this book, as per general usage within the industry, you will find the word “poster” used to describe both posters and open edition prints. Now here is a fascinating product. It has been around for decades. Thomas Kinkade was the most famous and prolific artist to have used canvas transfers. This format originally made up almost all of his limited edition prints, although he too succumbed to the lure of giclee printing. Canvas transfers are made for less than giclees and still create results that make it hard to believe they are reproductions. Kinkade used offset prints to diversify his pricing, offering them as a way to differentiate product sold through galleries, not in his gallery program. Canvas transfers start out as usual offset prints. The first step is to apply a special clear acrylic coating that binds to the ink. After the clear coat hardens, the prints are bathed in a chemical-and-water solution until they soften so the paper can be removed from the bound acrylic and ink top layer. A transparent adhesive paper goes between the hardened layer and a canvas substrate. The final step is to mount the layers to the canvas using a heated vacuum press. There are other methods, such as binding the paper directly to the canvas, but the chemical bath process produces the best results. The cost to make a canvas transfer and have it stretched on a frame runs from $0.50 to $2.00 per united inch. You calculate united inches by adding the outside dimensions of the length and the width of the stretched image area. Thus, a 16” x 20” canvas image has 36 united inches with a cost of $18.00 to $72.00. Even at the high price, it is less than the cost of a giclee printed on canvas and mounted on stretcher bars. The result is something that looks like an original, especially when additional coatings are added to the canvas transfer after it is stretched. Sometimes clear gels are applied to create the effect of brushstrokes on the pieces. Other times, paint highlights are added. Kinkade, in his day, had van tours to galleries with his highlighters featured … go figure. An obvious benefit is canvas transfers, unlike prints on paper, require no glass or plastic to protect them. This way, they show well in galleries and on the walls of collectors. Now that you are well informed with some basics on the different kinds of prints that are most commonly seen in the marketplace, you may have a clearer idea of which of these methods best suits your own art and needs. By coming to grips with the question of what medium best suits you and your art, you can proceed to other decisions regarding whether you should self-publish or seek a publisher. Should you decide on the latter, you would be better prepared to target publishers who use the medium you have chosen as ideal for your art. That photography is a fine art medium is a well-established fact. Practically from its first days, visual artists have used photography as a way to express themselves. American photographers Alfred Steiglitz and Edward Steichen were pioneers in making photography fine art, and efforts by the Metropolitan Museum of Modern Art have been instrumental in maintaining this as a fine art medium. Today, with the tremendous variety of digital equipment, photographers are better equipped than ever to develop unique artistic visions from their work. It is a fact that photography is a much more difficult medium to break into the print market with than painting. When asked why this was so, I used to say that most people didn’t appreciate the art in photography. I believe they mistakenly felt if they had been standing in the same spot with an expensive Hasselblad or Nikon camera, then they might have gotten lucky enough to taken the same photo. What they leave out is a critical eye for composition, and the training and experienced required to turn photography into fine art. In an interesting twist, with the availability of powerful and affordable digital cameras, I think more people now know it takes the eye of an artist to create a fine art photographic print. That is, they now have the resources within the financial grasp and realize it is not about the box that shoots the picture. Rather, the skill behind the camera is what creates fine art photographic prints. That is, in part, why I think photography as a fine art medium is growing in stature. I met Bonny Lhotka [www.lhotka.com] when she was exhibiting at ArtExpo. Years have faded my memory, but my best recollection says it was in Los Angeles in the early 1990s. As a founding member of the Digital Atelier [www.digitalatelier.com], she is a pioneer digital artist. She was far ahead of her time then. I am sure the show was both an experiment and a disappointment as she was well ahead of her time in presenting such work. Along with the other founding members of the Digital Atelier, Dorothy Simpson Krause and Karin Schminke, Bonny combines traditional studio and media techniques to create original fine art and variant editions using the latest computer equipment and imaging hardware and software. I have blogged about the Donnie Awards, which are awarded to winners of the Digital Art Contest sponsored by MOCA (the Museum of Computer Art. http://moca.virtual.museum/. The point is that digital art as an art form has arrived. I predict as younger generations – who have been exposed to nearly everything digitally – grow older that their interests will make the art form progressively more prominent. According to Wikipedia, digital painting is an emerging art form in which established physical-medium painting techniques – such as watercolor, oils, impasto, etc. – are applied using digital tools: a computer, a digitizing tablet and stylus, and special software. Digital painting differs from other forms of digital art, particularly computer-generated art, in that it does not include the computer rendering from a model. The artist uses painting techniques to make the digital painting directly on the computer. Many photographers have crossed over to digital painting. Notable among them is Marilyn Sholin. She is the author of The Art of Digital Photo Painting. She is an internationally acclaimed master instructor on the Corel Painter software. The process of creating art using digital means is involved and multi-stepped. There is image capture, whether through digital photography or image creation using a Wacom Tablet or other hardware/software combinations. There is a manipulation of the imagery through any number of software programs, such as Painter, Photoshop, Illustrator and so on. Then comes the output onto a myriad of substrates, including paper, canvas, vinyl, metal, wood and more. To produce a final desired outcome, the artist must print or collaborate with a printer on calibrating the equipment to get the output desired. Often pieces are further enhanced post printing to make them unique, one-of-a-kind and original. To my mind, the term convergent media makes more sense. It reflects the use of mixed media, which is an ages-old and widely accepted art term. Mixed media describe a multi-stage process of using different techniques and media to deliver an original piece of art. Convergent media does the same thing but implies the use of technology not available to previous generations of artists. I do not know whether convergent media will catch on as a useful descriptor for art made through a digital process involving cameras, scanners, tablets, software and printers, but I want to think it will. The artists using these tools are every bit as creative as those who draw and paint, and they visually express themselves in ways traditional painters cannot. It was only through the extensive use of digital tools that a box office hit such as Avatar (earning $1 billion worldwide in a week) could be made. Likewise, there is stunning digital art – convergent media if you will – that can only be made using digital tools. If you are a traditional painter, I do not advocate abandoning your tools or expertise in favor of a computer; but if you are so inclined, there are new vistas to be conquered with them. There is much more to say about each of these and other art print processes. The goal here is not to worry you with more than you need or want to know, but to give you some guidelines and basic knowledge of the overall commercial art market from a print-medium perspective. There is no wrong choice here. Your decision about which medium to use often will come down to considering economics, subject matter, personal preferences and competition. Social Media for Artists | How Important Is It?